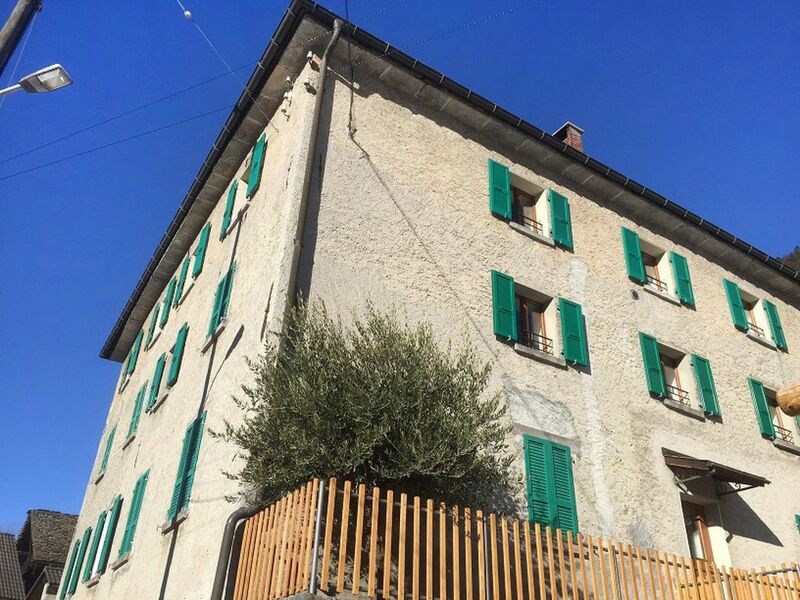 Anzonico 10 km from Faido: Old, simple small apartment house "Nostro Sogno", 1'000 m a.s.l., 3 storeys, terraced. Above Anzonico (nucleo), in the district Leventina, in a quiet, sunny, elevated position, 30 m from the edge of the forest, in a cul-de-sac, south facing position. In the house: storage room for bicycles. 150 m long steep, narrow motor access to the house. Stepped path (6 steps) to the house. Width of access road: 230 cm. Public car park at 150 m. Grocery 300 m, supermarket 10 km, restaurant 200 m, bus stop "Anzonico Paese Bus 124", railway station "Lavorgo" 5 km. Walking paths from the house 20 m, cable car 19 km, slopes 27 km, ski rental 27 km, ski school 27 km. Nearby attractions: Funiculare Ritom-Piora, Museo Dazio Grande, Museo Nazionale del San Gottardo, Boulder-ZONE. Well-known ski regions can easily be reached: Cari, Cioss Prato, Dalpe, Airolo-Pesciüm, Bedretto. Well-known lakes can easily be reached: Lago Ritom, Lago Tremorgio. Hiking paths: Strada Alta, Percorso del Cristallina, Sentiero Geoturistico del Campolungo, Giro dei Laghetti, Campo Tencia. Please note: baby equipment on request (extra). "Nostro Sogno", 3-room apartment 70 m2, south facing position. Spacious, simple and practical furnishings: small living room. 1 small room with 1 double bed (160 cm, length 200 cm). 1 room with 1 double bed (2 x 90 cm, length 200 cm). Open kitchen (oven, 4 ceramic glass hob hotplates) with dining table, cable TV, flat screen and radio. Shower/WC. Electric heating. Beautiful view of the mountains and the valley. Facilities: children's high chair, baby cot for up to 3 year olds (extra), hair dryer. Internet (WiFi). Please note: non-smoking house. Maximum 2 small pets/ dogs allowed. Beautiful location and simple but well equipped accommodation. Anzonico är en mysig liten by och det passade oss perfekt att komma upp lite på berget. Därifrån hade vi fin utsikt och nära till vandring och fina platser. Lägenheten är enkel men välutrustad och vi har ingenting att anmärka på.